Economists, political scientists and practitioners have long been aware of the deleterious effects of corruption. Transparency International, an international NGO, has been playing a lead role since its inception in 1993 in the fight to highlight the problem of corruption and in creating a forceful international anti-corruption movement. What is corruption? Corruption is the abuse of entrusted power for private gain. It hurts everyone whose life, livelihood or happiness depends on the integrity of people in a position of authority. What are some of the effects of corruption, but obvious and hidden? * A father who must do without shoes because his meagre wages are used to pay a bribe to get his child into a supposedly free school. * The unsuspecting sick person who buys useless counterfeit drugs, putting their health in grave danger. * A small shop owner whose weekly bribe to the local inspector cuts severely into his modest earnings. * The family trapped for generations in poverty because a corrupt and autocratic leadership has systematically siphoned off a nation’s riches. * The prosperous multinational corporation that secured a contract by buying an unfair advantage in a competitive market through illegal kickbacks to corrupt government officials, at the expense of the honest companies who didn’t. * Post-disaster donations provided by compassionate people, directly or through their governments, that never reach the victims, callously diverted instead into the bank accounts of criminals. * The faulty buildings, built to lower safety standards because a bribe passed under the table in the construction process that collapse in an earthquake or hurricane. Corruption has dire global consequences, trapping millions in poverty and misery and breeding social, economic and political unrest. Corruption is both a cause of poverty, and a barrier to overcoming it. It is one of the most serious obstacles to reducing poverty. 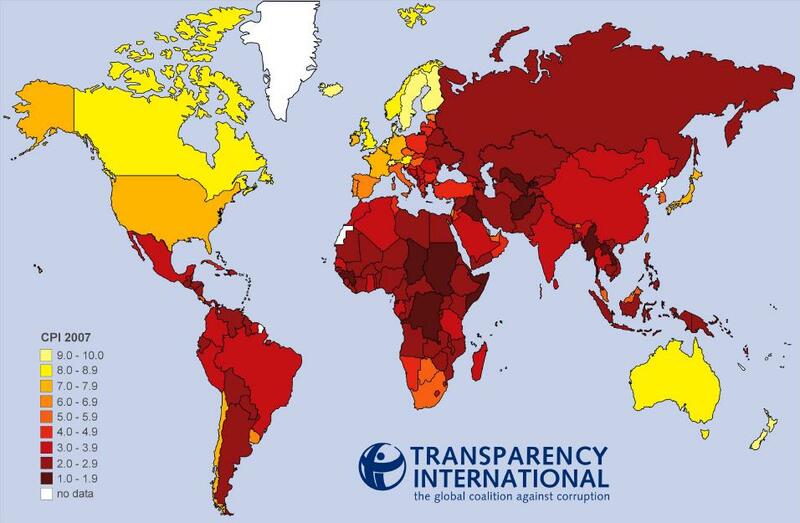 Here is a chart comparing corruption levels around the world in 2007. The higher the cpi score, the higher the level of perceived corruption.